Um, what religions were Dave Koresh and Timothy McVeigh? For that matter what religion was Adolph Schickelgruber (their real name)? McVeigh was an atheist. Koresh was some weird “i am jesus” nutbar. Hitler was anything but Christian and you would be hard pressed to find support for any of these killers in the Christian church. Contrast that with the hundreds of millions of Muslims who believe in the Koran’s “spread Islam through the sword” verses. You’re bound to fail trying to find equivalency between the actions of Christians and the violence of the Muslim religion. The best you can do are three or four evil people who would be rejected by the vast majority (virtually all) practicing believers of Jesus. There may be quite a simple explanation. Could it be they take exception to the USA illegally entering their countries and murdering thousands of innocents? i could start criticizing the laughable equation islam = terror but this post does not even get the facts right. heroic police women? it was a t-shirt vendor that noticed the smoke, then let an officer know who then asked two heroic police women to assist him. maybe read the articles you link to? BFP.. gotta to love your lazy presumption. But that is so Bush like. Get a grip , the loonies and baggers in USA and the world are in full swing. Could be just anybody in these times with a lot of setting up to blame others. One just can’t tell anymore. All one has to do is read these two paragraphs and it’s easy to see that it your theory is pretty thin. We shall see. Everyone else ran away. The two women did their duty while everyone else pissed their pants and ran. hmmmm….is this becoming like CNN, assume before an investigation? Explosive material was found, now lets find out who the nutcase was causing this sad incident. What religion is Erik Prince? What religion is Oliver North? What religion is Benjamin Netanyahu? It was a Muslim vendor who informed police about the smoke in SUV, go figure , his name is Hamid. You look like some terrorist Mosad agent. The vendor is a Vietnam veteran and a dare I say it an “African American” I saw him on CNN. An African American t-shirt vendor noticed something unusual and reported the matter to the police. Wha’ happen BFP? Even in the glare of publicity you can’t give an African American credit for anything? And second for doing his civic duty and calling police when he noticed something wrong in New York last night. And you are so fond of calling other people racist? Dear BFP: If you want to be taken seriously you have to report the news TRUTHFULLY. I find it interesting that BFP reported what was being reported at the time and time stamped it but that people are criticising them for not writing about things that didn’t become known until much later. I am sure BFP will update this article to reflect what is known now 24 hours later, but that doesn’t diminish the main thrust of the article which is that the suspect probably had Muslim fascism as the primary motivation. For what it’s worth I agree. http://bit.ly/a1JyZG CNN report, uh, no women mentioned AT ALL? blogs are not mainstream media so there is no urgency to “report” streaming news. BFP certainly did not flinch right away when the man shot his son right here. They waited and threw up a position of what they thought was an unfair system..right or wrong, it does not matter, but that is what blogs do. Muslim terrorists are not all “masters of explosives” Look at the record. The muslim terrorists sometimes come across like the gang that couldn’t shoot straight but that doesn’t make them any less deadly or motivated. The 9/11 terrorists had their “wedding suits” with them when they died except for one or two whose luggage was delayed and that’s how we know about the white wedding suits for marrying the virgins. That is wacko city. The shoe bomber failed as did the underwear bomber. They weren’t technically proficient but they were mass murderers in their intents. The same is true with the Times Square bomber. He could be a right wing wacko, or he could be a Muslim with sudden jihad syndrome. He wasn’t technically proficient but he intended to mass murder. Yes, most of the Muslim terror attacks have nothing to do with al-Qaeda, but they do support the worldwide Jihad as detailed in the Koran. A good proportion of the terrorist attacks are sudden jihad syndrome where individuals buy into the jihad mission and act alone. The media typically refers to these individuals as “unbalanced” or “mentally ill” and disregards the religious motivation. to promote this never to be ended War on Terror. The lead patsy was not so stupid and taped his FBI handler instructing him to place the bomb in the World Trade Centre. Strange how we never hear of these scandals on Fox News…..or BFP. Is this more conspiracy sh*t or is there more information, a court transcript or news story to back this up? What are the names of the people involved? “person of interest” being sought is a Pakistani – American who recently returned from 5 months in Pakistan. 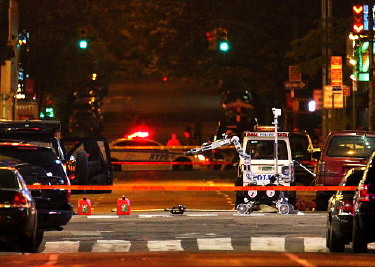 The type of car bomb with the propane attacks replicates previous al quada attacks in Europe. FBI says the instructions are up on Islamic terror websites for years. Add that up and what do you get, children? There’s so much info out there re: the FBI’s complicity in the 1993 WTC murders, however start here with this conversation between agent John Ancilev and bomb supplier Emad Salem, then go where it leads you.